Solomon, son of King David, ruled the sovereign nation of Israel and in 832 BC, began construction of the Holy Temple (Beit Hamikdash) in Jerusalem. In L.A., actor and co-writer Marcus J. Freed depicts the complexities of Solomon's world in a humorous, biblical comedy. 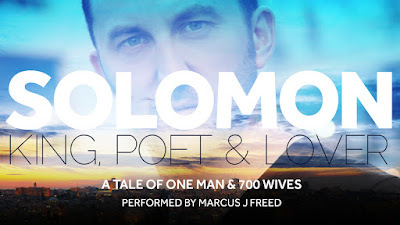 "Solomon: King, Poet, and Lover" takes you on a funny & fast-paced roller-coaster ride through the life of King Solomon. You meet Solomon as he tries to open the Temple, publish astonishing books of wisdom, experience every delicacy on earth, and keep 700 wives happy. Freed's Solomon is also the King of 700 wives and 300 concubines. The 60-minute performance is witty, engaging & thought-provoking. Los Angeles premiere runs: Sat 12/3 7.30pm, Sun 12/4 3.30pm; Sat 12/10 7.30pm, Sun 12/4 7.30pm. For tickets, click here.